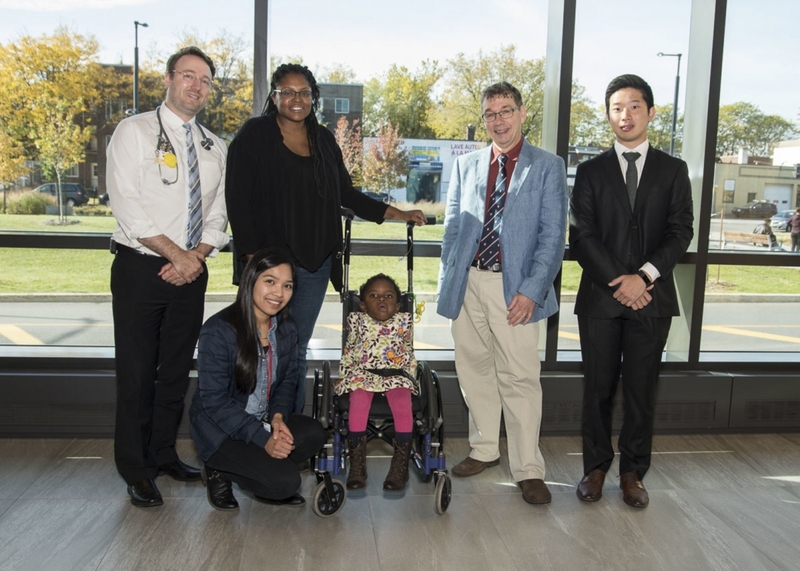 A unique collaboration among Shriners Hospital for Children – Canada, CHU Sainte-Justine and McGill University has enabled researchers to identify genetic mutations involved in a rare disease that causes scoliosis and bone malformations. The findings, published in The American Journal of Human Genetics, are likely to help doctors recognize the genetic disease, and could someday lead to therapies for the condition. The collaborative research began after a pediatrician treating an infant named Amaya observed that in addition to an abnormal thigh fold, the infant's hips were not quite aligned. Amaya was referred to Shriners Hospitals for Children – Canada. Reggie Hamdy, M.D., the hospital's chief physician (and professor of pediatric surgery at McGill), then conducted extensive examinations, identifying Amaya's hip deformity and scoliosis. The Shriners team suspected a genetic cause and referred Amaya to Philippe Campeau, M.D., a geneticist specialized in bone diseases who works at both Shriners and CHU Sainte-Justine to perform genetic tests and ultimately identify the faulty molecular mechanism. Amaya’s medical history and X-rays were compatible with spondylometaphyseal dysplasia (SMD), a medical term that encompasses scoliosis and abnormal growth plates in the bones. Initially Dr. Campeau and his team tested known genes already associated with SMD, but the tests proved negative. “Extensive research then showed that there was a mutation in fibronectin, an important protein found in the blood and in connective tissues such as cartilage," Dr. Campeau explains. Mutations in fibronectin had previously been found by other researchers in a kidney disease, glomerulopathy, but never in a bone disease. Before identifying the mutation in Amaya’s fibronectin, Dr. Campeau had observed similar fibronectin mutations in other children with the same disease by using exome sequencing (reading 20,000 genes). "I have been working for more than three years with Dieter Reinhardt, Ph.D., of McGill University's Faculty of Medicine and Faculty of Dentistry, to better understand how certain mutations in fibronectin can affect bones." Dr. Reinhardt's lab studies extracellular matrix proteins, how they function together with cells, and the negative consequences of genetic mutations. "Dr. Campeau asked me if we could try to understand the cellular mechanism of these mutations in fibronectin, which is normally an organizer of the extracellular matrix. That's when we became equal partners in this research project. The Quebec network “Réseau de recherche en santé buccodentaire et osseuse” provided immediately team funding for this new emerging project" says Dr. Reinhardt. "We then selected three mutations of the seven identified in different patients." Our work has clearly shown that the studied mutations prevent the secretion of fibronectin from cells. This work was performed by Chae Syng (Jason) Lee, Research Assistant in Dr. Reinhardt's lab, assisted by He Fu, then a postdoctoral fellow in Dr. Campeau's lab. Our current hypothesis is that blockage of fibronectin secretion occurs in cartilage cells (especially growth plates) and consequently prevents normal bone growth. The publication of these two teams’ research results in The American Journal of Human Genetics is important for several reasons. In addition to discovery and scientific advancement, it concerns a genetic disease that, though rare, is a risk for recurrence in future generations. Knowing that Amaya and other affected individuals might one day want to have children makes identifying the responsible gene important. For now, twelve families around the world are identified with this disease. In the years to come there will certainly be many more families recognized, guided by the publication of the findings of Drs. Campeau and Reinhardt. Knowing the affected gene, it is now possible to understand how the mutation leads to the disease and how to eventually arrive at the therapeutic stage within a few years. Dr. Campeau’s student, Nissan Baratang, is working on developing a mouse model of this disease with that idea in mind. This discovery will also have broader spin-off effects beyond SMD and understanding the role of fibronectin in cartilage: Dr. Campeau and Dr. Reinhardt, in collaboration with Dr. Florina Moldovan of CHUSJ, and Stefan Parent, orthopedic surgeon at CHUSJ and Shriners Hospitals for Children – Canada, have also found mutations in fibronectin in families with another more common bone-related disorder. Established in Montreal in 1925, Shriners Hospitals for Children – Canada is the only Canadian institution within the network of 22 Shriners hospitals. As a bilingual hospital, it offers short-term ultra-specialized orthopedic care to children in Canada, the United States and the world. Infants, children and young adults with orthopedic and neuromuscular problems such as scoliosis, osteogenesis imperfecta, club foot, hip dysplasia and cerebral palsy benefit from the expertise of our medical teams in treatment and rehabilitation. Affiliated with McGill University, the hospital has a Simulation Center and a Motion Analysis Center to spur excellence and innovation in care, teaching and research. Residents and health professionals take advantage of our Glen facility to complete their training and experience. Besides providing a patient- and family-centered care environment, the hospital, through telemedicine, outreach clinics and satellite clinics, is present in communities across Canada. Recognized as a health promoting institution, Shriners Hospitals for Children – Canada has been helping children reach their full potential for more than 90 years.